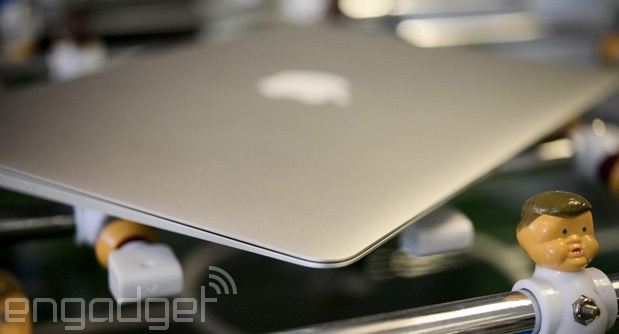 Another Apple event has come and gone, and there's still no MacBook Air with a Retina display. I won't blame you if you're frustrated -- now that there's a 5K iMac, the Air is Cupertino's last screen-packing computer to ship without an extreme-resolution display. For that matter, competitors haven't had qualms about releasing their own ultraportable laptops with extra-crisp visuals. So, what gives? Is Apple holding back? The company may not be offering answers, but it's most likely that the technology needed to make a Retina-equipped Air simply isn't ready for prime time. As much as Apple would like the Air to hop on the high-res bandwagon, it may have to wait until a whole bunch of pieces fall into place. Read on to see what I mean. You can summarize the biggest problem with two words: battery life. Stuffing more pixels into an LCD typically requires not just stronger backlights (since there's less light reaching each pixel), but also graphics processing powerful enough to draw all that extra content. You only need to look to one of Apple's own products, the third-generation iPad, for an example of the challenges involved. Apple had no choice but to give the tablet a bulky battery and a graphics boost (the A5X chip) if it wanted a Retina display using 2012-era backlighting and computing power; it wasn't until the iPad Air that you saw a no-compromise design. Yes, the MacBook Pro line has had Retina tech since 2012, but it had a thicker chassis to accommodate both a bigger battery and a faster, costlier processor. The MacBook Air doesn't have that luxury. It has to cram both a low-power display and a quick-yet-efficient processor into a very slim, affordable machine. The display side of it isn't that tough any more. There are already super-thin laptops that still wield high-grade LCDs, such as ASUS' latest Zenbook, and the 5K iMac is loaded with energy improvements (such as brand-new LED backlighting) that could help a portable. It's the visual horsepower that's harder to manage. Chips based on Intel's new Broadwell architecture should deliver that ideal blend of miserly power consumption and faster graphics, but they're not truly ready yet. The Broadwell-based chips that make the most sense for a Retina MacBook Air, the low-voltage U models, aren't likely to show until early 2015; the Core M you see in newer systems like Lenovo's Yoga 3 Pro is efficient, but it isn't exactly speedy. Apple has to either sit tight or make do with CPUs that might not be swift enough to meet its needs... and will definitely be obsolete in a matter of months. We've already seen the troubles that emerge when PC builders put Retina-level screens in their Ultrabooks before the technology is truly mature. Remember the mediocre 5-hour battery life of Toshiba's original Kirabook, or the so-so 6.5-hour lifespan of the Yoga 2 Pro? Samsung's ATIV Book 9 Plus manages a very respectable runtime of nearly nine hours, but that still doesn't compare well to the 12-plus hours of the current 13-inch MacBook Air. Apple likely doesn't want to take a big step backward in longevity just for the sake of a Retina display, and it may only complicate things if there's a new form factor (such as a rumored 12-inch screen) or additional performance demands. There's no question that the MacBook Air remains late to the Retina party, and that you've been missing out if you couldn't justify buying either a MacBook Pro or a suitably equipped Windows PC. Who wouldn't want a better laptop display that makes pixels all but disappear? Having seen the hurdles to making this system, though, it's no wonder that you can't buy one just yet. Quite simply, Apple has put itself into a corner -- it can't give the Air a Retina display right now without making noticeable compromises in battery life, portability and speed. There are signs that it'll overcome those obstacles soon, but for now, you'll have to be patient.